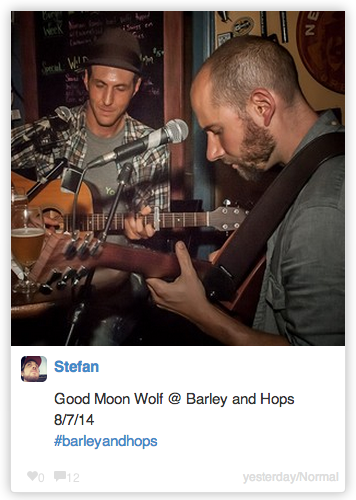 Jesse Tibbits, and Stefan Johnson make up the newly formed, Good Moon Wolf band. These two singer/songwriters found a common chord here along the Russian River, and have been sharing their music in intimate performances, like this one, at Barley and Hops in Occidental. Recently featured on KGGV-LP 95.1 FM "The Bridge," Good Moon Wolf is delivering new melodies and original songwriting right here in Sonoma County. If you catch one of their shows you will also hear classic covers, like Jimi's, The Wind Cries Mary which was filmed at Barley and Hops from the hip with available light and sound. It is grainy but the chemistry and quality of Good Moon Wolf shines through.